Reducing your household bills is more important than ever, and there’s loads of really simple and free ways of cutting down on energy consumption. Take a look at our top tips below for advice on how to make your bills come down and your bank balance go up! The majority of energy used by your washing machine is spent on heating water. Wouldn’t it be great if you could get your hands on a laundry detergent that gave you the same brilliant cleaning results, even in a cold wash? 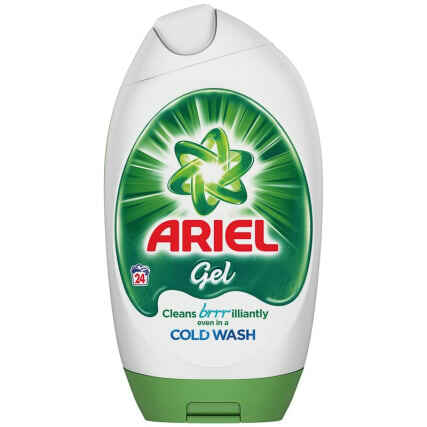 Ariel Gel has been made specifically for cold washes, potentially saving you more than 50% of energy per cycle*. What’s more it dissolves rapidly even during quick cycles, meaning you’ll use less water too! When you’ve got school uniforms, sports kits, work shirts and blouses to keep on top of, this could really make a difference to your energy bills. If you switch a light off for just a few seconds, you’ll save more energy than it takes for the light to start up again. So make sure you experience that ‘light-bulb-moment’ the next time you leave a room! Whether it’s Hive, Nest, Honeywell or something else, most big energy suppliers now have their own smart thermostat. While they will all vary in performance and ease of use, they’ve all been made with one thing in mind: to allow you to control your heating anywhere! Once installed, you’ll be able to download the appropriate app which gives you complete control and will help you reduce your energy consumption. B&M Top Tip: By turning down the temperature of your thermostat by just 1°C you could save as much as £60 on your annual energy bill (according to uSwitch). Not only will this reduce the amount of water used (handy if you’re on a meter) but if your shower water is heated by your boiler, you’ll reduce the amount of gas used to power your hot showers! In addition, you could buy an energy efficient shower head – these have also shown to use less water and ensure your money doesn’t disappear down the drain. Fridges and freezers are most efficient when they’re full to capacity. On the other hand, they use more energy when it’s less full, so make sure it’s well stocked and not left empty for too long. B&M Top Tip: After you’ve finished cooking, leave the oven door open to give you a bit of extra heat. Just remember to switch it off and never use it as a substitute for your central heating! Got any energy-saving advice of your own? Help our followers and fans save on their household bills by sharing your tips on Facebook, Twitter & Instagram.